This week I have an appointment to see a professional who is well educated, extremely gifted, highly experienced, and quite respected in her field. My dentist. Our family has always been pretty good about getting our teeth examined and cleaned on a regular basis. We got the kids started with dental care when they were very young. It didn’t hurt that their first dentist had a cool purple outfit and a bucket full of toys they got to choose something from at the end of the appointment. My memories of the dentist as a child were not so pleasant. As an adult I avoided them for a while. Becoming a parent brought me back to reality. I decided to be an example (a good example, that is), even tolerating those gag-inducing x-rays once a year. They have to use the kid-size x-ray film because – contrary to what Spouse might say – I DO NOT have a big mouth. I admit that I’ve been putting off having a couple of fillings taken care of. Yes, I know that’s irresponsible and silly and possibly costly and all that. So this time I’ve kept my scheduled appointment and didn’t cancel like I did one other…. fine – a few other times. Unfortunately, my procrastination gave the gum gremlins a perfect opportunity to settle in. It is at the point that York County can fit into one particularly obnoxious cavity. Let me predict how this date with the dentist will go. We will chat briefly while I try to settle myself into the almost reclining chair that drops into launch position when the drilling begins. I will request (i.e. plead for) something to numb the area where they will give me the shot that numbs me before they get anywhere near me with a drill because, well, I’m a big baby. For the rest of the afternoon I will likely be cranky because eating will not be an option for at least a couple of hours. Everyone knows you don’t have to be hungry to be miserable about not being able to eat. I’ll also be numb around the bottom right lip and very possibly drooling. Naturally, the stars aligned so that I’ll be attending a meeting that evening and will attempt to be social while trying to keep the saliva in check. There isn’t a good reason for me to avoid getting cavities taken care of because I happen to go to the best dental office ever. My wonderful hygienist lets me answer her questions between her prodding. We both have daughters, though hers is about 20 years younger than mine, but she appreciates those “don’t blink” stories I share with her. I think she does anyway. My hygienist is very patient with my x-ray gagging and always tells me I did a great job. I don’t even care if she’s paid to say this so those little pieces of film don’t get flung across the room. It keeps me coming back every six months. I’m thankful that my dentist’s office makes very sure I don’t forget our little rendezvous. I received an automated phone call, a text message, and an email. I believe they’ll be sending a Golden Retriever and a drone if I’m not there on time. 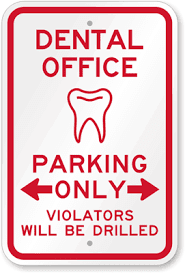 If you are reading this and are not a fan of going to the dentist, you do not have my permission to justify your hesitation because of my wimpiness. I think everyone should keep on top of their own dental health, especially since there are plenty of dentists who specialize in skittish patients. It’s not my favorite thing to do but I know it’s important, so I will just grin and bear it. After all, they’re just fillings…. nothing more than fillings.